I like to hand sew things, and ever since the kids were old enough to notice me sewing, they have wanted to have at it. 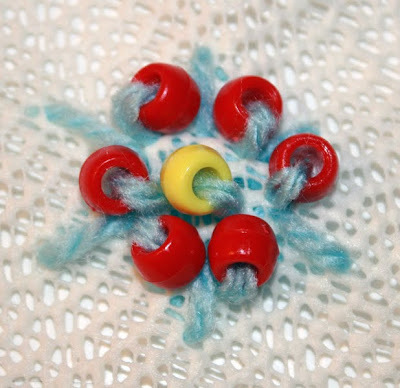 When they were really little I put together a toddler sewing kit, which I blogged about here. It was very basic with large lacing cards and beads. They loved it for quite some time, but now they are kind of over it. It was good for two and three year olds, but now that they are five and nearly four they want something a little more involved and more like the real deal. 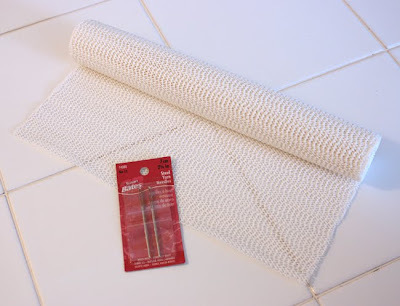 I spotted a particular type of shelf liner in rolls in the Dollar Tree last week and on closer inspection it was the perfect material for learning to sew with. It's cheeeeap. You get a nice few feet of it for a dollar. It's flexible but not flimsy or easy to tear. It's got somewhat irregular holes in it, so it's not limiting in the same way as counted cross stitch material or plastic canvas. It's made of an almost spongy plasticy foam type material, so the holes stretch as the big kid friendly needle goes through them. See! It's made for the job! All I had to do was cut a load of lengths of various coloured yarn and find some big beefy blunt needles. 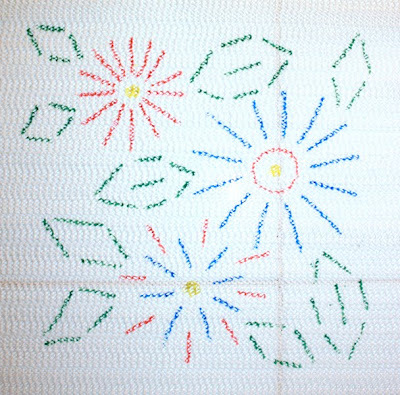 The needles I got were from Jo-Ann craft store and were two in a pack for $1.29. Really chunky, with big eye holes for easy threading and very blunt. 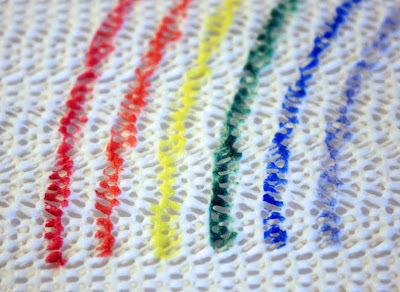 For a first shot at sewing I drew out lines of rainbow colours on a piece of the shelf liner in appropriate coloured sharpie permanent markers. My older daughter then sat carefully sewing in each colour in a running stitch. She really got into it and obviously felt that she was doing something very grown up. She really surprised me with how neatly she sewed it. I was expecting something much less precise as a first attempt. 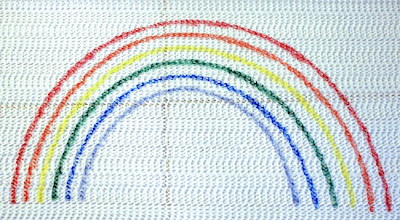 I just helped my younger daughter to play around with the sewing stuff in a less structured way because she isn't quite dexterous enough to complete something like the rainbow alone yet. She wanted to do more, so I thought I should try her with something a little more complicated. This time I drew out each stitch in sharpie for a bunch of flowers for her. She kept going at that for another half an hour. It's tucked away in the new sewing box for her to take up again when she's ready. 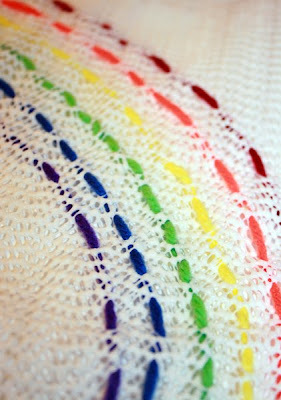 One issue we had with even the big needles was that the yarn would fray and be difficult to thread into the needle. 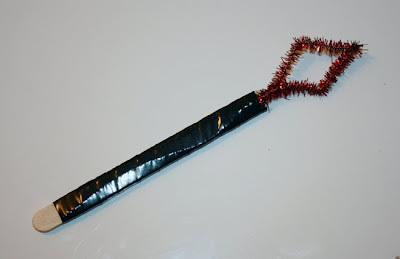 I put together a giant needle threader with a lollypop stick, a pipecleaner and some electrical tape. 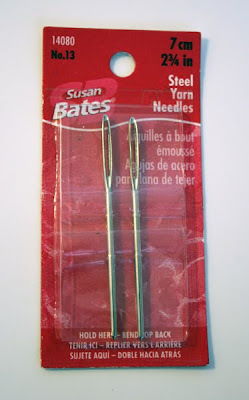 My daughters had never seen one of these before, so they were really impressed that you could use it to thread the needles in such a quick easy way. So here's our updated, bigger kid sewing box ready to be opened up again when they want to sew along with me. I like this set up as a half way between toddler lacing and proper material and sharp needles, because it allows the kids some extra autonomy, as I don't have to supervise as closely as I would with sharp needles. I'm more on call for help trouble shooting than being a guard on duty and they like that as much as I do. 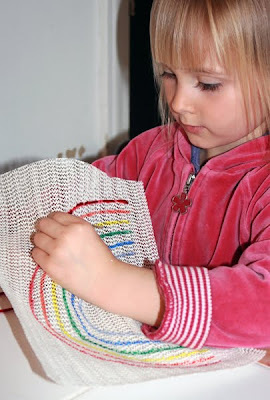 As they get older we can explore sewing pieces of the material together and I bet before too long my older daughter will be able to deal with some basic embroidery stitches like chain stitch. We didn't have an embroidery hoop, but if you do have one, that would make this even easier for the kids to manage. I am teaching my 5 year old son to stitch .. using a very large cound crossstitch ... this is soo much better. What a fantastic find they looked like they had a great time!! I think that its better than fabric as they can see through the 'fabric' and see where the needle needs to come out!! I did use taffita once but this is way better and sturdier. I wish we had places like the dollar tree and Target etc in South Africa - it seems like every one all ways finds the coolest things there!! You are truly brilliant. I will try and find some shelf liner today. I have been using burlap in an embroidery hoop but I like this better. What a wonderful idea! Your daughter looks so serious working on this. Cute cute cute! Love your needle threader too. You have a great blog! That is awesome! Thanks so much for the great idea. What a great idea! You've figured out a way to address all the issues that little stitchers face! I'll definitely try this with my youngest. And I think we may even have some of that very shelf liner around somewhere. Thanks for the tutorial! I want your brain! You have the most creative and inspiring ideas!!! OOOH this is such a fun fun fun idea! I can see some spring placemats in our future!!!! Thank you for this. My daughter has been asking me to let her sew. I am learning myself but I can put this together for her. This is an AWESOME idea! Brilliant! THANK YOU "sew" much! I have wanted to do something like this with my son, but all I could find out there were girly pictures...horses, flowers, etc. What a simple idea--I can easily draw a car on the liner and make him happy! Fantastic idea! Love your blog and all of your creativities! This is GENIUS! I am so excited about this! Such a great idea!! Can't wait to get some for my niece and son to try out. They will love this craft. I second the 'brilliant' nomination. I also bought a roll of this shelf liner 2 or 3 yrs back, knowing it had potential (I was thinking something along the lines of a texture book) but now I know it was destined for greatness. Thanks! Wow, that's an awesome idea! Your girls could make some beautiful and original decorations for their room with this idea. Since the liners are flexible, you could maybe even turn them into embroidered doll clothes and blankets too! This is fantastic, I'm looking forward to trying it out with my granddaughter. 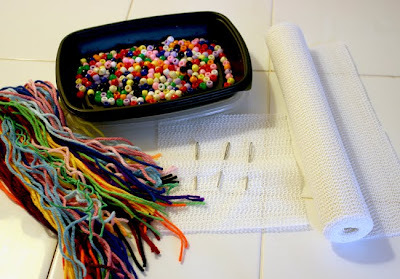 In addition, I think it will work very well for me when I teach bead embroidery classes - I can use a big surface and big beads so everyone in the class can see what I'm doing. Thank you!!! You are a genious! I have 2 girls and they are going to love it! Thanks for sharing it with us. Absolutely brilliant! My kids will love it, and maybe we'll try it during crafts at camp! Kids can make their own designs! Can't wait to try it, and I'm going to have to bookmark your site for more fun ideas. Thanks! amazing. you never disappoint. thanks for the fantastic idea! have a wonderful day. Ummm...Has anyone mentioned that you're a genius? I happen to have embroidery thread, a child-safe needle, and shelf liner. Guess what we're doing tomorrow for Sunday? Thanks so much for a wonderful way to start teaching my daughter sewing. This is SOOOO awesome. My 4 year old quadruplet grandbabies and their big 5 year old brother will absolutely love this. I've posted about it on our sewing business blog at http://sewingbusiness.com/2010/02/21/teaching-children-how-to-embroider.aspx Thanks again for the wonderful idea! WOW! You amaze me! I love your creativity and figuring out a different way! What a great idea! My little seamstress will love this. 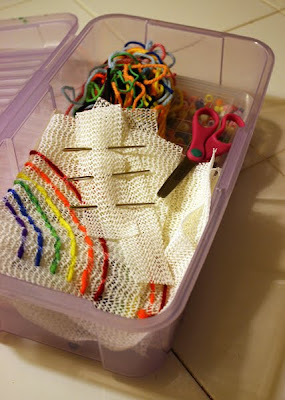 What an awesome idea- my little seamstress will love this! One of the things I love about your projects is they always seem so do-able - the material or the putting together is often quite simple, it's just that your ideas are brilliant. We're back in the UK so I'll have to keep my eyes peeled for something similar to the shelf liner. I am so happy you have a blog. You are so fantastic! Your daughters are so lucky to have you for a mom. You must be just about the best mom on the planet. Let me know if you want to adopt a 23-year-old, 'cause that project looks pretty darn fun to me! Absolutely brilliant! I can't wait till my kiddies get old enough to try this! Wonderful ideal, I will copy it for my four year old. She is now learning to sew, but with real needle, she is attaching a piece of fabric as a dress in a postcard made by her...Your solution seems simpliest to begin, of course!!! This is awesome. I'm gonna link to it tomorrow on Dollar Store Crafts! Brilliant! 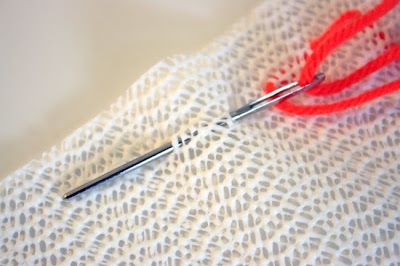 love the needle threader idea. very cute rainbow too! Hi hon! I just featured this post on the Mr X Stitch Facebook fan page. :) Such a wonderful idea for us mama stitchers!! :) My kiddos will love it! Brilliant! I love your needle threader! This is a genius idea!! Very clever. I remember doing something like this in elementary school using burlap. But nowadays, it might be easier to find plastic shelf paper than burlap. LOL. Making up sets of these would be great gifts for my nieces & nephews. Wow!! I wish brilliant ideas like this popped into my head. :) I look forward to my daughter being old enough to participate in this kind of fun activity. oh i love this. so going to use this with my brownie troop. You are a a genius. I know that word gets tossed around, but seriously. You are amazing. I love this idea! Since the stuff is easily cut, you could even cut two shorts, pants, or tops shapes to be sewn together. maybe to put on a cardboard doll? I tried the sewing a picture (train, flower) for my 5 and 3 yo today, but they're not quite ready for it. the 5yo is a boy, with typical slower hand/eye co-ordination and the 3yo, well, is 3! But they were very excited about it. Next time I'll try hooping it. They haven't done much lacing work, so we'll work on that for a while. Thank you! I posted a link to the project on my blog at http://fastercraft.com/. I also took a picture form your post for my post, is that okay? thank you for sharing this. We did some embroidery for Christmas (some felt ornaments)...to my huge surprise, both my young sons and daughters couldn't get enough of it. I am sure they'd love this too. Bless you for sharing it. *5 weeks until we get her in Ethiopia! This is fantastic! I've been hand sewing a lot lately and my six year old is begging to try her hand. The lacing cards just aren't cutting it any more. 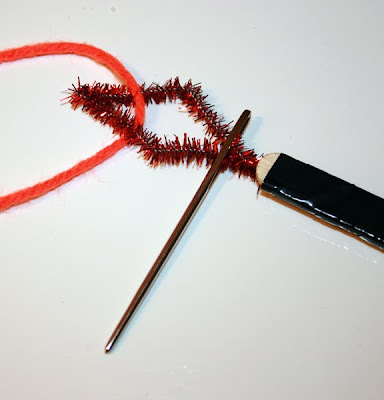 The pipe cleaner needle threader is BRILLIANT. My 4 year old daughter loves to sew, but is constantly asking me to thread the needle. I'll try this method instead. This is a great idea! I just found you via your comment on "How about orange?". you now have another folower. I would like to use this idea with my group of kids. i run a children's craft activity at a family camp each summer (up to 30 x 3-12 year olds at a session) and this is perfect for an activity. I am always on the look out for cheap, simple activites for a large age range of kids. This is great! I made a feature about it on my blog The Bibirays Bitsi Muses and linked it to this page. This is soooo awesome!! I can't wait to do this for my daughter. Thanks so much for sharing and your needle threader is ingenious!! Thank you so much! My 5 year old daughter loved this! She feels great and can do this while I'm sewing!! My daughter is having a sewing party for her birthday and this would make a great activity! Thank you for the great photos to go along with the fun ideas ! Oh fabulous idea, kids will love it, and very inexpensive. I love it. Come see what you inspired! http://www.holiday-kids-crafts.com/sewingforkids.html ALL Five of my little girls have been sewing for the past two days. I also found place mats at the dollar store that make the perfect transition project! I love this idea! I just linked to it on my blog in a post about a toddler sewing basket and will probably revisit it again in the next couple of weeks. I love the idea of this as a springboard into the world of embroidery. Thank you so much for sharing this! 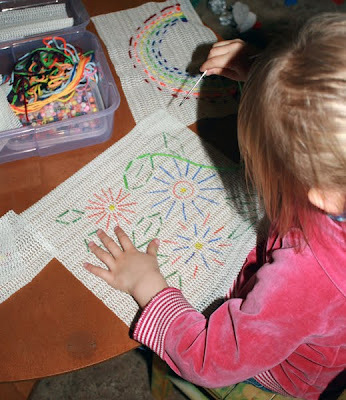 I'm teaching a french class to kindergarten through 5th graders, and was looking for a cheap and easy imitation of embroidery - a traditional french craft. This is absolutely perfect! Thank you! Been looking for ideas to introduce sewing to my 7 year old daughter. Your ideas are great and so simple! Thanks! I absolutely love this idea! I taught some children that I babysit for and my niece how to sew by using your idea! Thank you so much!!!!!!!!! I also linked up to your post on http://sensationallysrh.blogspot.com/... Thanks again! It has been four years--almost to the day--since you first posted this ingenious idea. It was brilliant then, and it is still brilliant now!!! I am not a seamstress--I don't even own a sewing machine--but I do like to hand sew things like hems, missing buttons, and ripped seams. My almost-5-year-old granddaughter is fascinated with my little sewing box and jar of small spools of thread, and for her birthday I wanted to get her a sewing box of her own. It was in doing a Google search that I came across your post, and I am so glad that I did! I just lovelovelove your idea, and I know that my grandmunchkin will, too! Thank you for the wonderful blog post. 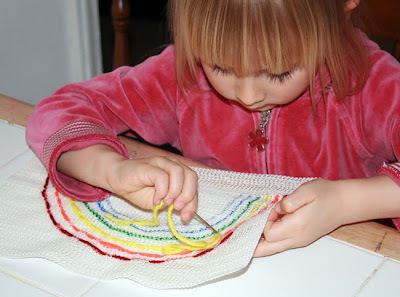 I will be trying this with my 5 year old seamstress!